The Research Triangle Park Headquarters building is a 17,000 sf administrative office and community conference center that serves as the “Town Hall” of the Research Triangle Park. The building is sited in a meadow and framed by a row of existing willow oaks. Organized around a copper-clad, scalene triangle that serves as the main entry and public lobby, the geometry of the building’s triangle, the iconic symbol of The Research Triangle Park, is derived from the mapping of Raleigh, Durham, and Chapel Hill in plan. The majority of building program is contained within two simple brick volumes. One brick volume is an 8,000 sf administrative wing that includes office space and meeting rooms for the daily operations of the Park. Open space planning, lower workstations, and interior storefront in this volume allow the staff to have a clear visual connection to the existing oaks and the meadow beyond as well as to the formal courtyard. The second brick volume contains the more public spaces in the building. The Community Meeting Room is a multipurpose space that serves a variety of functions such as dinners, lectures, seminars, and board meetings. A Pre-function space opens directly into the courtyard that provides an opportunity for outdoor events. 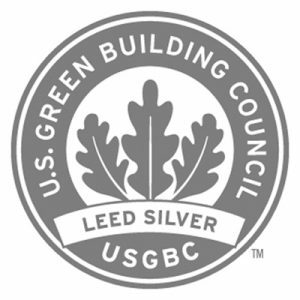 The Headquarters achieved LEED® Silver certification.